A member of the University of North Carolina, Western Carolina University offers courses in the arts, sciences, technologies, humanities, and professions. Students can elect degree programs at the bachelor’s, master’s, or doctoral level of study. Doctoral degrees are offered in educational leadership and physical therapy. As a regional institution, it serves the people of North Carolina from its residential campus at Cullowhee and through off-campus instruction in Asheville and other locations. Western Carolina University creates learning opportunities that incorporate teaching, research, service, and engagement through on-campus, off-campus, on-line and international experiences. The university focuses its undergraduate, master’s and three doctoral programs, educational outreach, research, and creative and cultural activities to sustain and improve individual lives and enhance economic and community development in western North Carolina and beyond. Western Carolina University is located in the scenic Appalachian mountain ranges in Cullowhee, North Carolina. The university consists of the main campus in Cullowhee and resident-credit centers in Asheville and Cherokee. A faculty of about 675 serves a student body of approximately 9,400 in resident-credit and extension classes. The Cullowhee campus is in a rural valley between the Blue Ridge and Great Smoky Mountains, fifty-two miles west of Asheville and seven miles south of Sylva on North Carolina Highway 107. The location at the southern end of Cullowhee Valley in the heart of the Tuckasegee River basin gives it an unusually attractive setting. The closest commercial airport to the university is located in Asheville. The central campus consists of about 233 acres, including beautifully wooded areas and modern academic, student-residence, recreation, and athletic facilities. The Blue Ridge Parkway, Great Smoky Mountains National Park, Qualla Boundary (Cherokee), Fontana Lake, and numerous resort areas offer golfing, skiing, fishing, hunting, hiking, water sports, and other recreational opportunities nearby. Western Carolina University, a constituent institution of The University of North Carolina, functions under the jurisdiction of the Board of Governors of The University of North Carolina and the Board of Trustees of Western Carolina University. Policies of the Board of Governors are administered by the president and the General Administration of The University of North Carolina. The Board of Trustees receives its authority by delegation from the Board of Governors. The chancellor is the chief administrative officer of the university. The Faculty Senate, the principal policy-recommending body of the faculty, operates under the provisions of a faculty constitution and bylaws. Western Carolina University is accredited by the Southern Association of Colleges and Schools Commission on Colleges to award baccalaureate, master’s, and doctorate degrees. Contact the Commission on Colleges at 1866 Southern Lane, Decatur, Georgia 30033-4097 or call 404-679-4500 for questions about the accreditation of Western Carolina University. A varied academic program is offered by the university’s seven colleges. Through the Graduate School and the academic program colleges, the university offers graduate degree programs in numerous major areas leading to the master of accountancy, master of arts, master of arts in education, master of arts in teaching, master of business administration, master of entrepreneurship, master of health sciences, master of physical therapy, master of music, master of social work, master of project management, master of public affairs, master of school administration, master of science, master of science in nursing, education specialist in educational leadership, education specialist in school psychology, master of fine art and the doctor of education. Complete information about the degrees listed above is available in the Graduate Catalog of The Record. The six academic program colleges of the university offer programs leading to the bachelor of arts, bachelor of fine arts, bachelor of music, bachelor of science, bachelor of business administration, bachelor of science in education, bachelor of science in nursing, bachelor of science in social work, and bachelor of science in electrical engineering. The College of Arts and Sciences. Bachelor of Arts with majors in anthropology, English, history, interdisciplinary studies, international studies, philosophy, political science, sociology, and Spanish. Bachelor of Science with majors in anthropology, biology, chemistry, communication, computer science, criminal justice, emergency and disaster management, environmental science, forensic science, geology, history, interdisciplinary studies, mathematics, natural resources management, political science, and sociology. The College of Business. Bachelor of Science in Business Administration with majors in accounting, business administration and law, computer information systems, innovation leadership, entrepreneurship, finance, management, marketing and sport management; Bachelor of Science in Hospitality Tourism Management; Bachelor of Science in Entrepreneurship. The College of Education and Allied Professions. Bachelor of Science in Education with majors in elementary education, inclusive education, middle-grades education, and health and physical education. In collaboration with the College of Arts and Sciences and the College of Fine and Performing Arts: Bachelor of Science in Education with majors in art, comprehensive science, English, mathematics, music, social sciences, and Spanish. Bachelor of Science with majors in birth-kindergarten, parks and recreation management, psychology, and special studies. The College of Engineering and Technology. Bachelor of Science with majors in construction management, electrical engineering, engineering; Concentrations in mechanical, manufacturing and electrical power, electrical and computer engineering technology, engineering technology. Various minors and certificate programs are also offered in construction management and in engineering technology. The College of Fine and Performing Arts. Bachelor of Arts with majors in art, music, stage and screen, and special studies. Bachelor of Fine Arts with majors in art, theatre, and motion picture and television production, and a concentration in art education. Bachelor of Music with music education, music performance and commercial and electronic music as concentration areas. Bachelor of Science in interior design. The College of Health and Human Sciences. Bachelor of Science with majors in athletic training, communication sciences & disorders, emergency medical care, environmental health, nutrition and dietetics, recreational therapy, and Bachelor of Science in nursing, and Bachelor of Social Work. The Honors College. Western Carolina University’s Honors College, founded in 1997, was the first residential honors college in North Carolina. The Honors College is a community of high-achieving students who participate in honors courses, special research with faculty, and social activities (planned by a student board). Open to all majors at WCU, the college accepts qualified new students (freshmen or transfers) and students already enrolled at Western. Accepted students are invited to live in the Honors residences (Balsam and Blue Ridge Halls). Completion of honors work leads to a special diploma from The Honors College. Additional information is available at http://honors.wcu.edu. Western Carolina University operates on an academic year of two semesters of fifteen weeks each. Additionally, a full array of programs and activities is offered during the summer term. Day classes are scheduled Monday through Friday. Night and Saturday classes, usually meeting once a week, are available in Cullowhee, Asheville, Cherokee, and various other locations. Commencement exercises are held at the end of the fall and spring semesters. Free document delivery service that provides access to articles from approximately 25,000 journal titles that can be accessed remotely. Electronic reserves collection that can be accessed remotely. Faculty members and students participate in a wide range of service and research activity. The university’s service centers add impetus to the programs of the colleges and departments and provide significant assistance to the region in which the university is located. Accessibility Resources. It is the mission of the Office of Accessibility Resources (OAR) to remove barriers and ensure equal access for all qualified students with disabilities. We accoplish this mission by providing accommodations and related support services for students with documented disabilities. Accommodations are provided when deemed necessary and reasonable for a particular student and are determined on a case-by-case basis through an interactive process between the student and OAR. Accommodations may include, but are not limited to, testing accommodations, note-taking accommodations, alternate format texts and materials, assistive technology, and communications assistance (such as sign-language interpreters or CART services). It is the student’s responsibility to disclose his/her disability, to request academic or physical accommodations, and to provide documentation. The request can be made at any time; however, some accommodations may take time to put in place, so it is best to make the request as early as possible in the semester. OAR also provides coaching, self-advocacy training, awareness events/activities, training for faculty and staff, and accessibility monitoring. For more information, contact Ms. Wesley J. Satterwhite, Director, 828-227-3886. accessibility@wcu.edu. Center for Career and Professional Development. The Center for Career and Professional Development encompasses resources and services that support students’ self-assessment, career exploration, and pursuit of experiential and post-graduate opportunities. The Center for Career and Professional Development is in the Reid Building Room 150. For more infomation visit http://careers.wcu.edu. Center for Rapid Product Realization. The mission of the Center for Rapid Product Realization is to match the College of Engineering and Technology’s resources of laboratories, faculty and students with the manufacturing and business needs of western North Carolina. The goal of this engagement is to grow and transform the region’s economy, enhance student learning through real-world project experiences, and improve the quality of life. The Rapid Center has special expertise in four areas: rapid prototyping, advanced manufacturing, intelligent sensors, and optoelectronics. The Center in collaboration with the Small Business and Technology Development Center (SBTDC), and the Center for Entrepreneurship and Innovation serves as the US Economic Development Administration (EDA) university center for North Carolina. Faculty/student projects, particularly the two-semester senior capstone projects, are one of the principal avenues for interacting with the western North Carolina community. Projects have included improvements to wheelchairs, sensors to help persons with dementia, new products for the Christmas-tree industry, rehabilitation devices for children and the elderly, and devices to help men and women of the US. Army and Navy Special Forces. Commercialization of technology is the central theme of these regional and statewide initiatives. 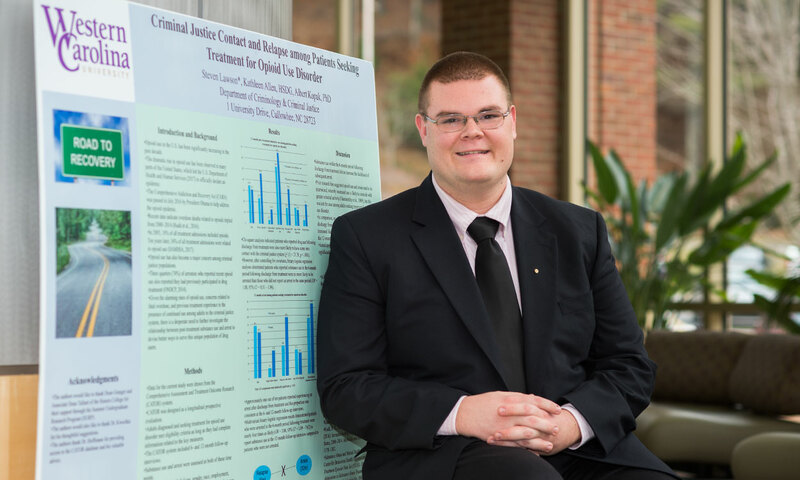 To learn more about the student/faculty projects and how to become involved with the Rapid Center, visit http://rapid.wcu.edu. Center for Service Learning. The Center for Service Learning helps WCU students, faculty, and staff find service opportunities in the region. The office plans and promotes volunteer opportunities, facilitates course-based service learning projects, and tracks and recognizes student engagement in service through the Lily Community Engagement Award program. Service opportunities are available at over 130 community agencies and include many types of projects. Through service learning, students can improve their understanding of course content, meet community needs, develop career-related skills, and become responsible citizens. Each year, ECU offers nearly 100 courses with service learning components, spread across every college and school of the university. Department of Veterans Affairs (VA) Educational Benefits. Western Carolina University is approved under the provisions of Title 38 United States Code, Chapter 36, to receive and process VA education benefits. Persons eligible and entitled under provisions of Chapters 30, 31, 33, 35 and Sections 901 and 903, and Title 10 United States Code, Chapters 1606 and 1607 may enroll in programs approved by the North Carolina State Approving Agency. All inquiries concerning Veterans Affairs educational benefits should be addressed to the VA Certifying Official, Military Student Services, 138 Camp Building, Western Carolina University, Cullowhee, North Carolina 28723, telephone 828-227-3022/2135. Highlands Biological Station. The Highlands Biological Station (HBS) is a field station for biological research and education focused on southern Appalachian ecosystems and organisms. Founded in 1927, HBS has been an Inter-Institutional Center of the University of North Carolina since 1976. Western Carolina University has served as the administrative campus for HBS since 1981. Twenty regional colleges and universities also participate in the Station’s programs as member institutions. HBS is located on the Blue Ridge Escarpment about 30 miles south of Cullowhee in the town of Highlands, North Carolina. The topography, latitude, and high rainfall of the area combine to yield extremely rich biotic and environmental diversity, making HBS an ideal locale for field studies in environmental biology, conservation, aquatic ecology, population biology, community and ecosystem ecology, and systematics. Its facilities are open to students and senior investigators engaged in research on the organisms and environments of the southern Appalachian region. Station facilities include housing (40 beds in several residences), a self-service dining hall, well-equipped research space, and teaching classrooms and laboratories. The 23-acre campus also includes the WPA-built Highlands Nature Center, which offers educational exhibits, K-12 outreach, and a wide variety of public programs, and the 12-acre Highlands Botanical Garden, which features hundreds of native plant species in a variety of southern Appalachian habitats. Both the Nature Center and Botanical Garden are free and open to the public. Each summer HBS offers a series of one-to-two-week courses and workshops, taught at the advanced undergraduate and introductory graduate levels, as well as short courses and workshops for general audiences. Academic credit through WCU or UNC-Chapel Hill is available for most courses and workshops. Limited financial aid is available for courses, and a research Grant-in-Aid program also provides financial assistance to graduate students conducting thesis research at HBS. Since 2001 the Station has hosted a fall semester-in-residence undergraduate program in environmental biology in cooperation with the Institute for the Environment at UNC-Chapel Hill. WCU students majoring in biology or environmental sciences are encouraged to apply to this unique program. To learn more about the programs, courses, and research opportunities at the Highlands Biological Station, or to visit see the HBS website (http://highlandsbiological.org/) or contact Dr. James T. Costa, Executive Director, Highlands Biological Station, 265 N. Sixth Street, Highlands, NC 28741; 828-526-2602; costa@email.wcu.edu. Information Technology. The Division of Information Technology is responsible for providing technology assistance, information and services in support of Western’s mission and aspirations. These services include providing information resources to students, faculty, and staff to support teaching, learning, research, administrative and regional engagement efforts. Information Technology provides advice, planning and technical guidance for the appropriate use of technology in support of the university’s educational endeavors. Information Technology is located in various campus buildings with assistance available at many of WCU’s facilities beyond the Cullowhee campus. The university is an active member of EDUCAUSE, a nonprofit association whose mission is to advance higher education by promoting the intelligent use of information technology. The university is also a member of Internet2, a software and networking consortium led by members from the research and education communities, industry, and government. Information Technology has over 80 staff and is comprised of the following units: The Office of the Chief Information Officer, Academic Engagement and IT Governance, Chief Technologist and IT Security Office, Coulter Faculty Commons, IT Applications and Systems, IT Project Management Office, Instructional Technology and Desktop Services, and Networking and Communications. The university uses a state-of-the-art administrative system that allows students and faculty to do virtually all of their business with the university, such as register for courses or post grades, online. All students receive a WCU email account that allows them to communicate with their peers, faculty members, and university offices. The myWCU portal is the primary tool used by students to access email and other campus and course-related information. Blackboard Learn is the primary instructional delivery system in support of traditional classroom and online courses. There are over 5,000 WCU-owned computers and mobile devices in offices, classrooms, and lab facilities, all with connections to high-speed broadband networks. Students enjoy high-speed network connectivity from their residence hall rooms or from the EDUROAM wireless network available throughout the Cullowhee campus. The Technology Commons, our IT walk-up location, which boasts a multitude of services, is located on the ground floor of Hunter Library. Their hours can be found at tc.wcu.edu, but the Technology Commons is always open 24 hours during the last two weeks of the fall and spring semesters. Users may call the Information Technology Help Desk locally at 227-7487 or toll free at 866-928-7487, email ithelp@wcu.edu, or visit the Online Help Desk/Self-Service page located at: help.wcu.edu for assistance with any Information Technology service or resource. Faculty routinely work with the Coulter Faculty Commons to integrate technology into their teaching activities. Information Technology supports both Windows and Apple operating systems along with various software applications including a focus on Microsoft Office products. Office products are provided for faculty, staff, and students along with upgrades for the Windows operating system for university and personal computers. Information Technology also provides computer virus protection software to all students, faculty, and staff and is committed to keeping computers safe, secure, and current in a highly networked campus computing environment. Many software packages are centrally licensed with a limited number of licenses available in labs and classrooms, but they can also be accessed anytime/anywhere through our VCAT service. Visit vcat.wcu.edu for more information. Statistical packages and other specialized software, including digital media editing, geographical information systems, and engineering design programs, can be found in collaborative labs and classrooms. IT Video Services provides consultation and technical support for campus video needs, including audio/video production, streaming, live event support and video conferencing services through the North Carolina Research and Education Network (NCREN). The Division of Information Technology (DoIT) web site at http://doit.wcu.edu provides a variety of useful technology information and self-help resources, as well as links for downloading software for personally-owned computers and accessing computer purchasing information. Mentoring and Persistence to Success (MAPS) (http://www.wcu.edu/learn/academic-success/maps/) is a comprehensive academic-support program which assists eligible students in choosing and working toward their academic, career, and personal goals with programs tailored to meet individual needs. Services include academic advising, career and personal coaching, and mentoring. Students may qualify for all free services if they meet one of the following criteria: They are first generation college students OR are independent status OR meet US. Department of Education income guidelines. MAPS also coordinates freshman and early-start and transition programs including the Academic Success Program (ASP), Catamount Gap, Catamount Gap Abroad, and STEM Enrichment. Mountain Heritage Center. The center collects, interprets, and disseminates knowledge about the southern Appalachian region and its people. Its research and artifact collections promote public awareness of the region’s rich natural and cultural heritage using publications, exhibitions, and demonstrations presented both on campus and throughout western North Carolina. The center also collaborates with public schools in preparing programs for educational enrichment and provides a learning experience for university students through internships. Support for the use of research software, including ArcGIS, Qualtrics (a survey tool), SPSS, SAS, and STATA. The Coulter Faculty Commons can be reached at 828-227-7196. New Student Orientation. To make the transition to college life easier, Western offers orientation programs for new students and their families. Students attending orientation have a chance to meet other new students, talk to their professional academic advisor, and register for their classes. Orientation is the time for students and family members to become familiar with the academic demands of the university, to meet the faculty, and to learn more about the concerns that accompany campus life. For more information, call 828-227-7735. School-University Teacher Education Partnership (SUTEP). SUTEP, housed in the College of Education and Allied Professions, partners with more than 100 schools in the 18 western North Carolina school systems. These partnerships are designed to enrich school-university relationships, strengthen teacher preparation, and provide professional development for teachers and school administrators. Southern Appalachian Biodiversity and Ecology center (SABEC). Faculty and students in Biology and Natural Resources Conservation and Management collaborate with Highlands Biological Station, regional groups, and public schools in education, research, and outreach focused on ecology and biotic diversity in the mountain ecosystems of western North Carolina and surrounding areas. The Small Business and Technology Development Center at Western Carolina University (SBTDC at WCU). The SBTDC center at WCU is staffed by four dedicated business professionals who provide comprehensive business counseling for small-to-medium-sized companies. These counselors serve the 14 western counties of North Carolina through two convenient locations on campus at Western Carolina University in Cullowhee and in downtown Asheville. Most business owners or their executives come to the SBTDC initially for confidential counseling to assess their business and develop a plan to make their business better. Together, the counselor and company select tools to implement that plan – financial analysis, market studies, focus groups, strategic needs assessments, government procurement assistance, and/or strategic planning retreats, to name a few. If funding is a need, the SBTDC provides hands-on assistance with loan package preparation and approaches to other capital sources (including angel investors). For companies involved in scientific research & product development, our team assists with federal Small Business Innovation Research (SBIR) and Small Business Technology Transfer (STTR) grant proposals. As a program of the university system, the SBTDC strives to leverage the assets of WCU to benefit businesses in the region. Each year, in partnership with professors from the College of Business, well over 250 students from WCU participate in applied learning projects designed to assist companies with improvement and growth. These projects provide a hands-on learning experience for students and much needed resources for businesses. Finally, the Center administers a summer internship program for rising seniors at WCU who work with a small business in the region for eight weeks over the course of the summer. Students apply for specific positions with companies that have expressed interest in hosting an intern. For more information, visit the SBTDC at WCU Center page at http://www.sbtdc.org/offices/wcu/. The Advising Center works with all newly admitted students in academic advising, course scheduling, and selection of major. Upon declaration of major, students are advised in their academic department; however, their academic advisor in the Advising Center will continue to work with them in areas of university policy and personal academic advisingand will continue to offer assistance for students facing academic difficulty. The Academic Advising Center is a unit within the Division of Student Success and works closely with other units such as Center for Career and Professional Development, Office of Student Transitions, Office of Accessibility Resources, Writing and Learning Commons, Math Tutoring Center, Mentoring and Persistence to Success Office, and Center for Service Learning. In addition to connecting students to various campus offices, the Advising Center completes course registration for all new incoming students in their first semester. The Advising Center staff is heavily involved with Academic Action, outreach to surrounding community colleges, populating Learning Communities, enrolling students in and teaching a Learning Contract course, and assisting with the evaluation of Liberal Studies courses. The Writing and Learning Commons (WaLC) provides tutoring and academic support services to help students develop the skills, knowledge, and confidence they need to achieve academic excellence. Services include course tutoring, writing tutoring, academic skills consultations, international student consultations, and online writing resources. Writing tutors collaborate with students from all classes and majors at every stage of the writing process, from brainstorming and prewriting to drafting and revising. Course tutors facilitate collaborative sessions and offer strategies for effective study. Academic skills consultants conduct in-class workshops and one-on-one consultations focused on improving students’ reading, note taking, time management, test preparation, and test taking skills. Visit http://tutoring.wcu.edu or call 828-227-2274 to schedule appointments. Tutoring services are available during fall, spring, and summer terms and are offered to enrolled students without charge. All consultations and tutoring sessions take place in the WaLC or in designated classrooms on campus. Distance students and students taking classes at Biltmore Park are encouraged to use Brainfuse, an online tutoring service provided by The Division of Educational Outreach. For more information about Brainfuse, visit http://onlinetutoring.wcu.edu. The Mathematics Tutoring Center (MTC) in Stillwell 455 provides drop-in tutoring for math courses and math-related content across the curriculum. Call 828-227-3830 for more information. Through the Division of Educational Outreach, the teaching resources of the university are made available to the residents of the region and the state. The division promotes and coordinates noncredit and off-site credit courses and programs, supports military students (residential and distance), manages distance learning student support, operates a testing center, and supports academic departments in non-credit offerings and conferences, camps and other events. Many workshops, institutes, conferences, seminars, and short courses are available for Continuing Education Unit (CEU) credit. Distance Learning. Division of Educational Outreach collaborates with the academic colleges, Information Technology, university student service units, community colleges and businesses to provide support to distance learners. Distance Learning Student Services supports students by assisting with application and admission processes, providing online tutoring, supporting students through electronic and personal contact; supports distance faculty where appropriate; and provides data for distance learning decisions. Distance learning extends the boundaries of the university by using a variety of telecommunications technologies in the online and off-campus delivery of UNC approved distance programs. On occasion, students may meet in a regular classroom setting or on Saturdays for clinical activities at distant instructional sites. Distance learners may be required to attend an orientation on the campus of Western Carolina University or at an outreach site. Cordelia Camp Building. The division manages a conference and training center, which is equipped with classrooms, computer labs, and interactive video facilities. The center serves businesses, agencies, and schools in Western North Carolina with continuing professional education workshops and retreats. Camps and Conferences. The division provides support for educational conferences, camps and special events and is the facilitator of faculty led conferences on campus. Several annual conferences are held each year on campus with expert faculty from Western Carolina University and from throughout the U.S. Experienced staff can help develop budgets; assist in program planning; secure appropriate facilities; arrange for lodging, meals, banquets, and tours; provide brochure design, printing, and mailing service; handle registrations; and manage financial details. Depending on the university calendar and preference of the sponsors, conference participants may be housed in campus facilities or off-campus commercial settings. Professional Growth and Enrichment. With the rapid explosion of new knowledge and technologies, up-to-date information is vital for today’s professional. A range of opportunities, both online and face-to-face, is available for continued learning in many fields. There are non-credit opportunities for recertification or certification in a variety of fields including nursing, project management, and drug and alcohol. Programs can be tailored to meet specific organizational needs and to assist in corporate training efforts at any site. Military Student Service-Educational Outreach houses military student services including the certification office for military-affiliated funding for active duty, veterans, spouses and dependents. The Office acts as a one-stop for all things military from recruitment to graduation. The Office advocates for military students and educates the campus as to the special circumstances of military students. Additionally, the Office supports the Student Veterans Association. Testing Center. The Continuing Education Testing Center oversees administrations of a variety of tests. Testing includes TEAS, SAT, CLEP, DSST and MAT and other national exams. The Center also serves as a testing site for a variety of high-stakes/professional exams and is an approved site for proctored testing for distance learners through UNC-Online Proctoring Network and the National College Testing Association. Western Carolina University distance students must also test at a testing center approved by one of these two organizations. Each test will have specific requirements for registration. For a list of all testing and requirements, visit the website http://testing.wcu.edu. Online students. The Center also serves distance students from other universities. The Center provides testing for a variety of professional testing. Students should consult with faculty about proctored testing requirements. Summer Sessions. A full summer academic program at the graduate and undergraduate levels is offered in Cullowhee, Asheville and online. Special short courses, workshops, and institutes many subjects are available at these locations and in Cherokee. Visit the website at http://summer.wcu.edu for more information. The University Experience Course. The University Experience course introduces students to the online learning environment using WCU Blackboard. The course focuses on online student services, helps students develop specific skills necessary for success in an online course, and creates a community of learners. The course was developed to serve students enrolled in distance learning programs or students enrolled in special offerings delivered in partnership with the Division of Educational Outreach. Western Carolina University Cherokee Center. The Western Carolina University Center in Cherokee was established in 1975 in cooperation with the tribal government of the Eastern Band of the Cherokee Indians. The Cherokee Center and its staff serve as the collaborative hub between the Eastern Band of Cherokee Indians and Western Carolina University. The center offers pre-admissions counseling, academic advisement, financial aid assistance, and study-skills development services in addition to courses leading toward academic degrees and non-credit courses. The center also serves as a support system for the Native American Student Organization and the EBCI Western Alumni Club. The center serves Cherokee and the surrounding communities and is available to all the people of the region and serves anyone interested in attending any college or post-secondary institution. The office for the Cherokee Center is located on 1594 Acquoni Road, next to the Cherokee Youth Center. The Center operates Monday thru Friday 8 am - 5 pm. Contact the Center by phone at 828-497-7920. Western Carolina University at Biltmore Park. WCU hosts a large instructional site in Asheville which offers a rich mix of undergraduate and graduate degree programs. Most are programs designed for working professionals looking to complete their degrees while continuing their careers. At WCU Biltmore Park, the University offers two doctoral programs in Education and Nursing, and 10 master’s programs which include degrees in accounting, business, counseling, English, nursing, public affairs, social work, and technology. Additionally, WCU offers three baccalaureate completion programs in engineering, hospitality and tourism and nursing. WCU’s instructional site in Asheville is located at 28 Scheck Parkway, halfway between downtown Asheville and Hendersonville at Biltmore Park Town Square. More information can be found at https://biltmorepark.wcu.edu or at 828-654-6498. Office of Institutional Planning and Effectiveness. The Office of Institutional Planning and Effectiveness (OIPE) is responsible for coordinating the university’s institutional research, strategic planning, accreditation, and assessment activities. OIPE is responsible for the university’s state and federal reporting obligations, assists university departments with surveys, and provides university statistical information requested by other agencies. Visit the OIPE website at http://www.wcu.edu/learn/office-of-the-provost/oipe/. Office of National and International Awards (ONIA). The Office of National and International Awards (ONIA) is the quintessential resource at Western Carolina University for providing qualifying students with the knowledge and skills necessary to apply for and win competitive national and international awards. ONIA coordinates the institution’s support of students who wish to apply for competitive national and international awards, such as the Fulbright, Goldwater, Marshall, Truman, or Rhodes. Please note that ONIA does not coordinate WCU financial aid, scholarships, or graduate fellowships. For information on how to apply for external competitive awards at WCU, please contact the Director, Dr. Brian Railsback, at brailsba@wcu.email.edu or call 828-227-3933. The chancellor’s division includes units that deal strategically with internal controls, compliance, and external messaging and outreach. Reporting to the chancellor are the general counsel with responsibility for legal services and compliance, the chief audit officer with responsibility for internal audit and risk management, and the chief of staff with responsibility for external affairs. The chief of staff to the chancellor also serves as the university’s primary external affairs officer, providing strategic direction and vision to the university’s communication and outreach to external constituents such as governing boards, system officials and staff, elected and appointed officials, media, and prospective students and their influencers. Functions reporting to the chief of staff include communications, public relations, government relations, special events, and university marketing. Communications and Public Relations. The Office of Communications and Public Relations, which includes the university’s news, media relations, photography, and videography functions, is led by the chief communications officer. The office includes University News Services and Photography and Video Services. The office is the official liaison between the university and all news media, is responsible for photography and video used to promote the university, produces the university magazine and faculty-staff newsletter, issues press releases and answers media inquiries, and maintains news content and other messaging on the university’s website. External/Government Relations. The Office of External Relations is led by the university’s official liaison with elected and appointed officials from the municipal to the federal levels. The office pursues federal funding for WCU through congressional appropriations mechanisms and state funding through the University of North Carolina system’s established budget priorities process. In addition, the office serves as university liaison to important economic development entities within the local community and the greater western North Carolina region, including chambers of commerce and regional economic development organizations. Special Events. The Office of Special Events is led by the director of special events and is responsible for the strategic direction, planning, and implementation of top-level, university-wide special events on behalf of the chancellor and the chief of staff, both on campus and off. The special events team also serves as advisors to the Chancellor’s Ambassador student organization providing leadership and event support for functions held by the chancellor and senior leadership. The team members also serve as event consultants for departments across campus. University Marketing. The Office of University Marketing, led by the chief marketing officer, includes the university’s marketing, design, brand management, web and social media functions as well as the WCU Print Shop. The office is responsible for the management of the university paid-media plan, design for the university magazine, all recruitment collateral and advertising, web design and content management for the university’s external website, environmental design, signage and sponsorships, and oversight of all institutional social media platforms and channels. The Office of Legal Counsel and Compliance is led by the general counsel. General counsel and other legal staff provides legal advice to the Board of Trustees, the chancellor, the administration, the faculty, and staff on legal matters involving or affecting the institution; advises the university administration on a broad range of initiatives, policy matters, and issues; and serves as a liaison between the university and its related and affiliated entities on legal issues. In addition, the chief compliance officer is responsible for compliance functions, which support administration, faculty, and staff in mutual effort to maintain compliance with all rules and regulations applicable to WCU. The Office of Internal Audit is led by the chief audit officer and provides independent, objective assurance and consulting activity designed to add value and improve the university’s operations. The office’s primary goal is to help the university accomplish its objectives by bringing a systematic, disciplined approach to evaluating and improving the effectiveness of risk management, control, and governance processes. The North Carolina Center for the Advancement of Teaching (NCCAT) was established by the General Assembly of North Carolina in 1985 as a statewide center to recognize and support outstanding North Carolina pre-kindergarten through twelfth-grade public school teachers and to enhance teaching as an art and profession. Its ultimate goal is to retain of high-quality teachers in the classroom. A center of The University of North Carolina, NCCAT is governed by a board of trustees, and its programs and activities are conducted by a professional staff of faculty and administrators. Services are provided at Western Carolina University to further each student’s academic and social development. The Division of Student Affairs has general responsibility in this area, and its functions include providing comfortable housing, offering counseling services and health care, and enhancing the college environment with recreational and leadership activities. The Division’s website is available at http://www.wcu.edu/experience/dean-of-students/About.asp. The university’s residence halls are an integral part of campus life, offering a variety of experiences that contribute to intellectual, personal, and social development. The residence halls are staffed by Area Coordinators and professionals responsible for both the residential community as well as each student’s personal growth and development. The residence halls are open to all students, undergraduate and graduate, to the extent available. Freshmen and some transfer students are required to live on campus. This requirement may be waived if the student is married or lives with parents in a county contiguous to Jackson County. For full details regarding the residency requirement, please read University Policy #96 at http://www.wcu.edu/discover/leadership/office-of-the-chancellor/legal-counsel-office/university-policies/numerical-index/university-policy-96.asp. A variety of accommodations are available including private and double rooms, suite-style buildings, and graduate housing. Each room is furnished with computer data ports, single beds, study desks, chairs, dressers, and closets. Students provide their own pillows, bed linens, towels, lamps, clocks, wastebaskets, and telephones. (A list of suggested items to bring can be found on the Residential Living website.) Cable television is provided in student rooms and in designated public areas. Other amenities include vending machines, washers, and dryers. Mail service is provided to all residential students at the Student Mail Center located in the University Center. Mailing addresses are assigned by the Department of Residential Living and are provided when students receive housing assignments. Please visit http://housing.wcu.edu to learn much more about Residential Living and life in the residence halls at Western Carolina University. Off-Campus Housing Students who are eligible under University Policy #96 to live off-campus and choose to do so are responsible for making those arrangements and for meeting the associated obligations. 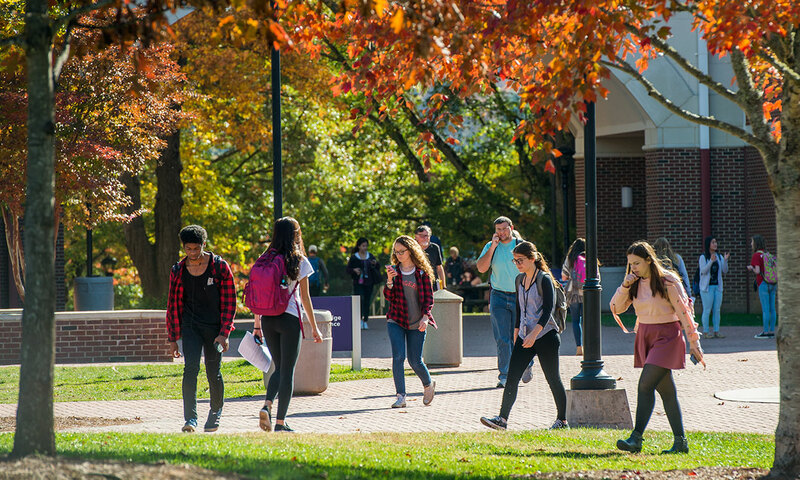 While the University does not endorse any off-campus housing, an on-line service is available to help University community members explore off-campus options: http://offcampushousing.wcu.edu/. Please review the Dining Services website at http://wcudining.wcu.edu for comprehensive information about eating on campus. Food service may not be provided when dining locations are closed during holidays and other periods when the university is not in session. Students living in university residence halls are required to purchase a campus meal plan each semester. Participation in a food-service plan is optional for commuting students. Special dietary requirements are accommodated by contacting WCU Dining at 227-7396. A variety of programs, activities, and services are available on campus. Students are encouraged to participate in activities outside of the classroom to enhance and broaden their academic pursuits. The student activity fee, which keeps participation for students at no or low cost, supports many of these activities and services. Athletics. Western Carolina University is a NCAA Division I institution with membership in the Southern Conference. With over 300 student athletes competing in 16 sports, WCU students have many opportunities to support their Catamounts. 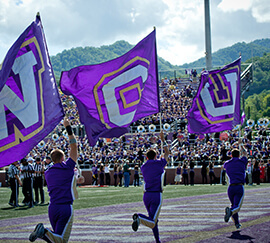 The mandatory Athletic Fee provides support for WCU Athletics, so students have free tickets to all Athletic events. More information about Catamount Athletics is available on the official website: http://www.catamountsports.com/. Base Camp Cullowhee. 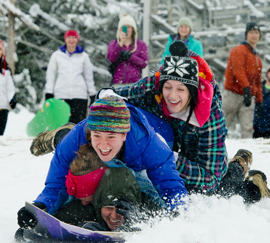 Located in Brown Hall, Base Camp Cullowhee (BCC) is the outdoor program of WCU. BCC provides outdoor trips and skills clinics to help students experience adventure in the great outdoors, learn new outdoor activities, challenge themselves to do more than they ever thought was possible, grow as people and leaders, connect with other people and friends, and explore their surroundings in wild western North Carolina. BCC also manages the Base Camp Climbing wall, a 50-foot-tall indoor climbing wall located in the Campus Recreation Center, and offers the campus community a rental program for outdoor equipment such as tents, sleeping bags, whitewater gear, and more. Many classes, clubs, and organizations take advantage of BCC’s teambuilding services to provide their group with unique training to reach their goals. For more detailed information, visit the BCC website: http://basecamp.wcu.edu. Campus Recreation and Wellness. Campus Recreation and Wellness (CRW) is housed in the Campus Recreation Center and works to create a campus-wide culture of wellness by providing programs, services, and facilities for individuals to engage and sustain the active process of healthy living. CRW is home to club sports, the group exercise program, intramurals, and the outdoor program Base Camp Cullowhee. Please visit the CRW website for more information: http://reccenter.wcu.edu. Center for Leadership. Located on the third floor of the A.K. Hinds University Center, the Office of Leadership and Student Involvement is committed to providing students with opportunities to continually enhance leadership skills and interests. 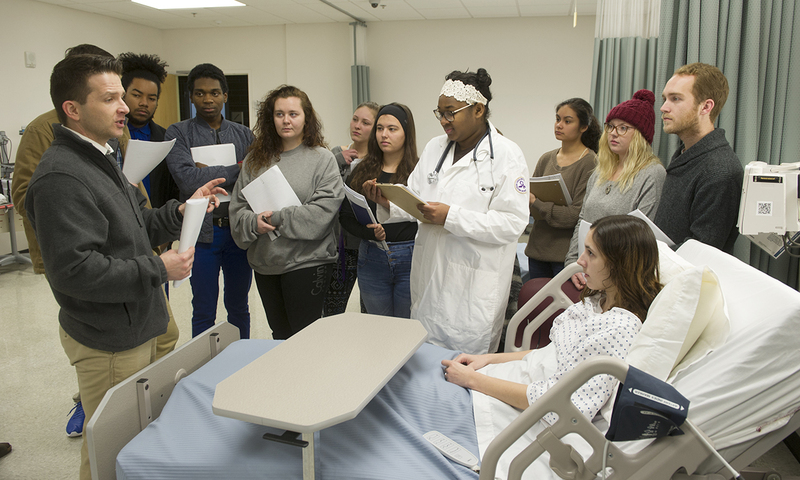 Through the Center’s curricular and co-curricular programs, WCU students develop exposed to a variety of leadership skills they will carry with them throughout their lives. Students will experience advanced leadership opportunities and gain skills they can use in their daily lives or within their personal/professional leadership positions. Through such student clubs and organizations as the Leadership Institute, Greek Life, and the Student Government Association, or through programs such as the Freshman Leadership Institute, the Whee LEAD Conference, CatCamp, CATalyst, or any one of the LEAD Living-Learning Communities (LLC’s), students learn how to make a positive impact on campus and in the greater community. In addition, the Office of Leadership and Student Involvement is home to over 30 leadership development courses (LEAD) and the Leadership minor. WCU is one of a select few colleges or universities that offer a minor in Leadership. The Leadership minor consists of a total of 18 credit hours (9 credit hour of elective courses and 9 required credit hours). 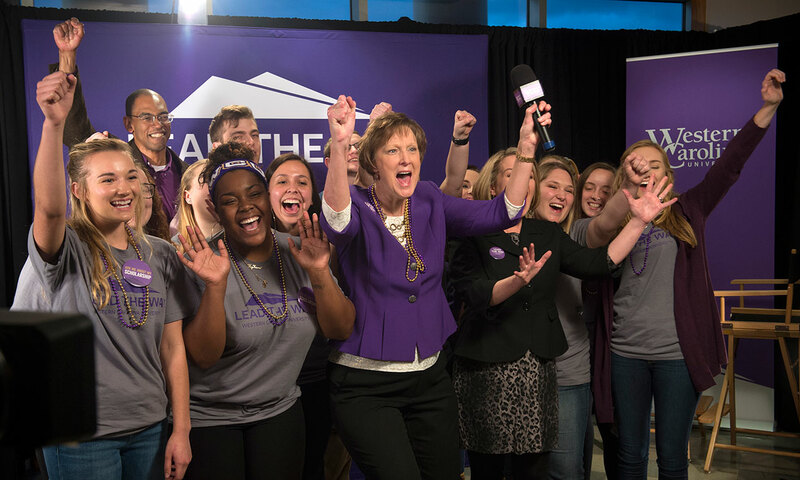 More information about the Office of Leadership and Student Involvement and the Leadership minor is available online: http://www.wcu.edu/experience/connect-and-join/department-of-campus-activities/student-involvement-leadership/. Counseling and Psychological Services. Provides free and confidential short-term counseling and emergency services for students. Other services include support groups, consultations, psychiatric medication assessments, referrals, and outreach presentations and programs. Please refer to our website at http://www.wcu.edu/experience/health-and-wellness/counseling-psychological-services-cps/ for further information on our services, staff, and mental health resources. Initial appointments can be made in person (Bird Bldg. 2nd floor) or by phone (828-227-7469). Please refer to our website for a list of our weekly groups, outreach presentation topics, and biofeedback services. Department of Campus Activities: Located in the University Center, the Department of Campus Activities is the place for students to study or hang out with friends, attend movies and events, and explore new ideas and activities. The Campus Activities team plans concerts, trips, arts and cultural events, and more to educate and entertain students. Student organizations including the Student Government Association and the event planning board, Last Minute Productions, are housed within Campus Activities. Leadership opportunities such as the Freshmen Leadership Institute are also offered. For more information, visit http://dca.wcu.edu. Greek Student Engagement and Development. Located in the University Center, Greek Student Engagement and Development (GSED) supports 22 fraternities and sororities represented by the College Panhellenic Council, Interfraternity Council and the National Pan-Hellenic Council. Membership in a fraternity or sorority can greatly enhance students’ collegiate experiences, and help them cultivate positive connections, social growth, intellectual development, and values-driven decision-making. For more information, visit http://gogreek.wcu.edu. Health Services. Health Services works to meet the healthcare needs of the WCU campus community. The staff includes physicians, physicians’ assistants, licensed practical nurses, registered nurses, and a laboratory technician. Health Services also supports the student-run ambulance service that allows for on-campus coverage for emergencies. Specialty services offered include a women’s health clinic, allergy and immunization clinic, and some limited pharmacy services. For more information, visit http://studenthealth.wcu.edu. Ramsey Regional Activity Center. Western North Carolina’s most versatile entertainment complex, the Liston B. Ramsey Regional Activity Center provides quality programming for the entire community. The 8,000-seat arena hosts major concerts, national touring acts, commencement and Catamount basketball and volleyball. Student tickets to major events are often available at a discount. For more information, visit http://www.wcu.edu/ramsey/. Student Government. The Student Government Association (SGA) is an active, vital part of the university community. Each student has the right to vote in all student elections and may participate in SGA by running for office or by applying for an appointed position. The SGA appoints voting members to various University committees, and the president of SGA is a member of the University’s Board of Trustees. Visit the SGA website at http://sga.wcu.edu for more information. I will live by high standards of academic and personal integrity. I will embrace my responsibilities as a member of this community. I will respect the rights and well-being of others. I will value diversity, inclusive excellences, and individual differences. I will engage myself in the artistic cultural and academic life of my University. I will celebrate and express pride in Western Carolina University. The WCU Community Creed also serves as the basis for the Code of Student Conduct. All students are held accountable to the principles expressed in the Community Creed and the standards for behavior found in the Code. The DSCE website is found at http://dsce.wcu.edu and includes important information about the Community Creed, alcohol and drug education, as well as student rights and responsibilities under the WCU Code of Student Conduct. Western Carolina University Police work to keep the campus community safe and help prepare the campus for emergencies. An annual safety report is posted online at http://www.wcu.edu/discover/campus-services-and-operations/university-police/ in compliance with the Jeanne Clery Crime Statistics Act (formerly the Campus Security Act). A link to an Emergency Information website is included at the bottom of all WCU web pages or can be opened at http://emergency.wcu.edu/ for details on campus preparedness and emergency notification systems. All students, faculty and staff are encouraged to carefully review this information. The University Police department is responsible for providing law enforcement, criminal investigation, and protective services on campus. University Police officers are certified by the NC. Criminal Justice Training and Standards Commission and meet all standards set by the Attorney General for law enforcement officers in this state. All crimes that occur on the campus of WCU should be reported to the University Police Department. Emergencies should be reported by dialing 8901 or 911 from a University telephone or by dialing 828-227-8911 from your cellular telephone; non-emergencies may also be reported by dialing 828-227-7301. Crimes may be reported by visiting the University Police Department, located in the Camp Building Annex, or by contacting an officer on patrol. Officers may also be summoned for emergencies by activating any of the emergency blue-light callboxes placed at various locations throughout campus. Information regarding crime reports, statistics, and prevention programs is available at the University Police department and on their website at http://police.wcu.edu. The Parking and Transportation Department is responsible for the administration of WCU’s parking system, vehicle registration, and traffic and parking regulations enforcement. State statutes provide that campus traffic and parking regulations have the full-authority of law, and violators may be subject to the penalties prescribed by such law. Everyone parking a vehicle on campus must register that vehicle with the Parking Services Office and display a current decal on that vehicle. Parking and traffic regulations literature is made available in the Parking Services Office, located in the Cordelia Camp Building. These same regulations are made available online at http://www.wcu.edu/discover/campus-services-and-operations/university-police/parking-services/parking-traffic-regulations/. The Parking, Traffic, and Safety Committee, composed of students, faculty, and staff, functions as an appellate board for faculty and staff members wishing to contest parking citations. Appeals concerning student violations are heard by a similar SGA appellate committee. The faculty and staff parking citation appeal form is available online at http://www.wcu.edu/WebFiles/PDFs/police_appeal_form_faculty_staff.pdf , or in the Parking Services Office. The student parking citation appeal form is available online at https://www.wcu.edu/discover/leadership/student-government-association/student-parking-ticket-appeals.asp. For more information, contact the University Parking Services Office at 828-227-7275 (PARK). Shuttle Bus System (CAT-TRAN). The shuttle bus system, or Cat-Tran, is operated through the University Police Department. Cat-Tran provides shuttle service along prescribed routes throughout the semester during day-class hours. Reduced shuttle service is available during evening, weekend, and summer hours. The Cat-Tran does not operate during holidays, spring or fall breaks, or semester breaks. The Cat-Tran buses are used for the daily shuttle routes and are not available for special event or group use. For information regarding routes, hours of operation, or other issues, please visit the Cat-Tran website at http://www.wcu.edu/discover/campus-services-and-operations/parking-and-transportation/cat-tran/index.aspx or call the Cat-Tran office at 828-227-8726 (TRAN). Bank Services. A Wells Fargo ATM is located on campus. State Employees Credit Union and BB&T ATM’s are in the A.K. Hinds University Center. Additionally, branch offices of Wells Fargo, BB&T, State Employees Credit Union, Sun Trust Bank, Macon Savings Bank, Carolina First Bank, Mountain Credit Union, United Community Bank, First Citizen’s Bank, and Jackson Savings Bank operate in or near Sylva. Books and Supplies. The Catamount Bookstore offers students a variety of educational materials and supplies. An extensive selection of paperback books is offered for class use and extracurricular reading. All books for graduate students and, distance-learning students – as well as supplemental text- and course-related materials for undergraduates – are sold by the store. Caps and gowns, graduation invitations, and class rings may also be purchased at the store. For more information, call 828-227-7346 or visit our website at http://books.wcu.edu/home.aspx. Clothing and Gifts. The Catamount Clothing and Gifts store offers students a variety of clothing, gifts, greeting cards and miscellaneous items. For more information, call 828-227-7346 or visit our Web site at http://merch.wcu.edu/home.aspx. Mail Service. Students residing on campus are assigned a mailbox with their room assignments. All other students may rent a box in the Cullowhee Post Office. US. postal regulations do not permit receipt of mail through general delivery after an initial 30-day period. A postal commodity machine offering stamps, envelopes, postcards, aerograms, overseas services, and other features is located in the University Center. Project Discovery-Talent Search. Talent Search is a federally-funded program through the U.S. Department of Education hosted here at Western Carolina University. Our mission is to assist first-generation college-bound students with enrollment in post-secondary schools. Talent Search provides a wide range of support services to 900 area middle- and high-school students. Academic, career, and financial aid counseling as well as a variety of summer and adventure educational experiences are also provided. Talent Search can be reached at 828-227-7137 or by visiting http://www.wcu.edu/engage/community-resources/project-discovery/about-project-discovery/. The Kneedler Child Development Center provides affordable, accessible childcare for approximately 60 children of students, faculty, staff, and community members. The center operates four classrooms (ages 1-5) staffed by qualified teachers who are committed to early childhood education. Each classroom offers developmentally -appropriate activities designed to stimulate social, emotional, intellectual, and physical development. The facility is in the remodeled west wing area of the Cordelia Camp Building. For further information, visit http://www.wcu.edu/engage/community-resources/kneedler-child-development-center/ or contact the center at 828-293-1530. Electronic Mail (email) Policy. University Policy #52 (see link above) also addresses the use of email. The university email system and email accounts are provided by the university as one of its primary means of official communication. An email message regarding university matters sent from an administrative office, faculty, or staff member is considered to be an official notice. Students, faculty, and staff are required to read their university email system messages on a regular basis to receive these official notices.